Maximum Capacity - Even though each cart lists a maximum capacity, you may not be able to fill the cart fully, depending on the size of your devices and adapters. Some adapters can cover plugs on the power strip, and some devices are too large to fit on certain shelves. Always measure your laptops or tablets and compare them to the listed compartment dimensions before you purchase. Shelf Style - Carts with vertical slots are more useful for tablet and mobile device charging, while those carts with horizontal shelves offer more room for larger devices like laptops. While some vertical-slot carts will fit laptops, make sure to again measure your devices to make sure they'll fit. Steel – Most laptop carts feature durable steel construction. They withstand heavy use and are nearly impossible to break into. 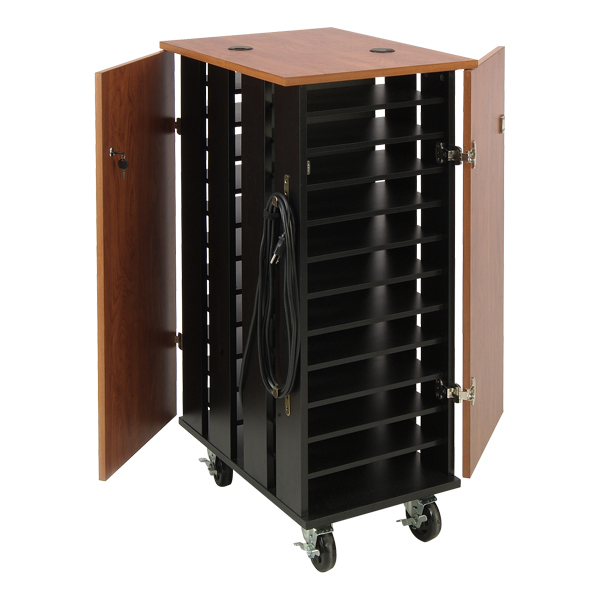 Laminate – If security isn't an issue, laminate carts are much more affordable. Wood – To add an attractive, classic look to your décor, you may want to consider an all-wood laptop cart. Your most secure choice is a steel laptop cart, and most models have lockable doors to help prevent theft and vandalism. You'll even find carts with translucent tambour doors so you can keep an eye on the contents inside. Notebook storage carts are available with or without an electrical outlet to plug in and charge each computer. Since students most often leave their laptops at school overnight, you'll likely want one with recharging capabilities. However, if you're using the cart for storage only, it may not be necessary. Underwriters' Laboratories requires that no more than 15 laptops be charged at the same time from one circuit. You can plug multiple charging banks into an automatic timer and set it to rotate charging of each, therefore charging all the notebooks from one circuit with a single plug. We strongly recommend a built-in timer, because they make it easy to charge more than 15 laptops. If you want to give students the freedom to plug and unplug their laptops, opt for a cart with electrical outlets at the front. However, if you don't want younger students yanking on cords, you can get a laptop cart that has outlets at the back where they are accessible only from a rear panel. Extreme heat or cold can damage valuable equipment, so most storage carts have louvers for ventilation. 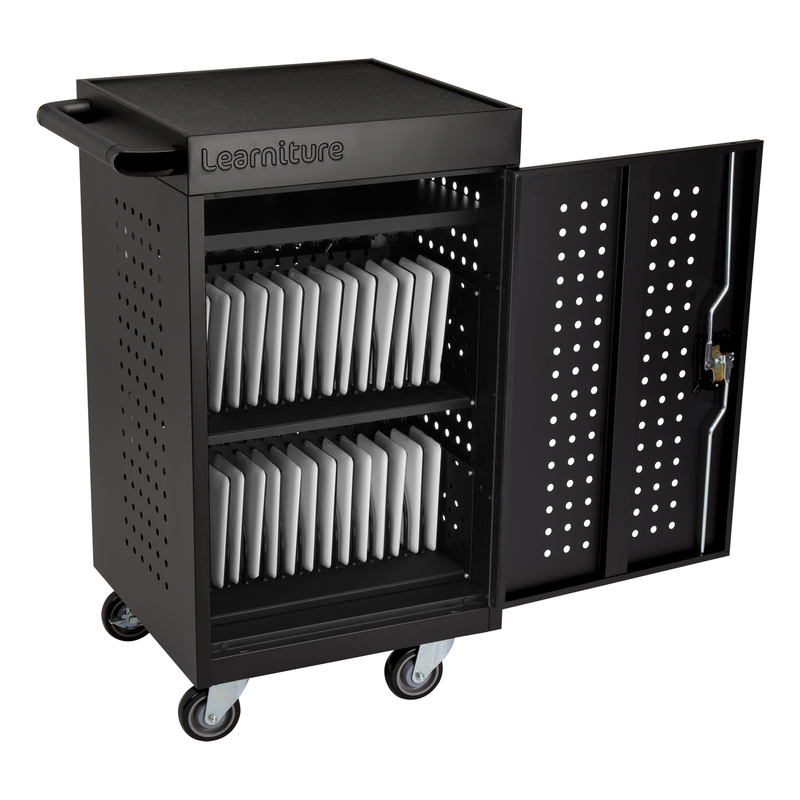 You'll want to make sure that your laptops stay cool as they charge, so louvers are especially important when choosing a notebook storage cart with electrical access. Laptop storage units are available with casters or non-pneumatic wheels — both provide a smooth, gentle ride. However, non-pneumatic wheels absorb more shock and function better over rough surfaces and outdoors. You'll want to prevent hard drive damage caused while jostling around, so think about the traffic patterns of the cart before you decide. Check out our selection of Laptop Storage Carts to start shopping online. If you're still not sure which secure cart is best for your classroom or computer lab, call us at 1-800-260-2776. Our friendly sales team is happy to answer your questions.